Today is my first day trying out this thing I saw on YouTube. 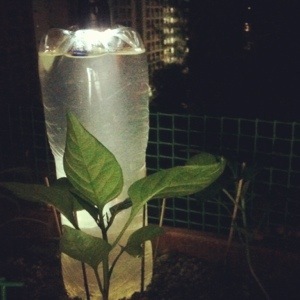 I DIY this by cutting a small hole on the bottle cap, fill the bottle with water and some homemade liquid fertilizer and stick in I to the soil near my plants. I will have to go away soon for about 2 weeks and this is my only worry, if it work then my problem is solved. Categories: plants | Tags: Bottle cap, DIY, Do it yourself, garden, Irrigation, pepper, planting, recycle, Self watering, Soils, water bottle, youtube | Permalink.